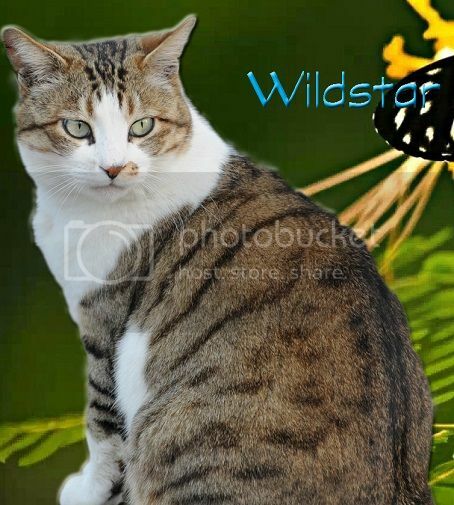 Wildstar wrote: "Then by StarClan, I give you your warrior name. Cardinalpaw, you will be known as Cardinalpelt. StarClan honors you and we welcome you as a full warrior of BrookClan." Padding forward, Wildstar rested her muzzle on top of Cardinalpelt's head. Cardinalpelt licked Wildstar's shoulder, then sat back and listened to the clan call out her new name. "Cardinalpelt, Cardinalpelt, Cardinalpelt!" cheered Acornpaw for his former denmate. Foxwater padded into the BrookClan camp, carrying dock in her jaws. She made her way into the den she shared with Thunderpaw, placing the dock into the storage. Waveheart pulled a shrew from the fresh-kill pile and sat down to eat. Twilightrunner pricked up his ears and padded over to hear what Wildstar had to say. "I, Wildstar, Leader of BrookClan, call upon my warrior ancestors to look down on this apprentice. He has trained hard to understand the ways of your noble code, and I commend him to you as a warrior in his turn. Havenpaw, do you promise to uphold the warrior code and protect and defend this Clan, even at the cost of your life?" "Then by StarClan, I give you your warrior name. Havenpaw, you will be known as Havenheart. StarClan honors you and we welcome you as a full warrior of BrookClan." Padding forward, Wildstar rested her muzzle on top of Havenheart's head. Havenheart licked Wildstar's shoulder, then sat back and listened to the clan call out his new name. "Havenheart, Havenheart, Havenheart!" cheered Minteagle for the clan's newest warrior. Spidertail padded into the BrookClan camp, carrying a mouse in his jaws. He made his way into the nursery, dropping the mouse at the queen's paws with a dip of his head. "I, Wildstar, Leader of BrookClan, call upon my warrior ancestors to look down on this apprentice. He has trained hard to understand the ways of your noble code, and I commend him to you as a warrior in his turn. Quickpaw, do you promise to uphold the warrior code and protect and defend this Clan, even at the cost of your life?" "Then by StarClan, I give you your warrior name. Quickpaw, you will be known as Quickbramble. StarClan honors you and we welcome you as a full warrior of BrookClan." Padding forward, Wildstar rested her muzzle on top of Quickbramble's head. Quickbramble licked Wildstar's shoulder, then sat back and listened to the clan call out his new name. "Quickbramble, Quickbramble, Quickbramble!" cheered Twilightrunner for the clan's newest warrior. Foxwater padded out of her den, dragging the body of Morningriver in her jaws. She made her way out of the clan camp and to the clan burial grounds, placing the she-cat in a hole and covering her body with earth. Cloveralder pricked up her ears and padded over to hear what Wildstar had to say. "Blazenest, is it your wish to give up the name of warrior and go to join the elders?" called out Wildstar once the clan had gathered. "It is." meowed Blazenest, his voice heavy with grief.